Sincere performances--under the director's sympathetic eye--allow humanity to overshadow the machinery of plot. 74 min. Magnolia Pictures. Director: Steven Soderbergh. Cast: Debbie Doebereiner, Misty Wilkins, Dustin Ashley, Kyle Smith (II), Omar Cowan. 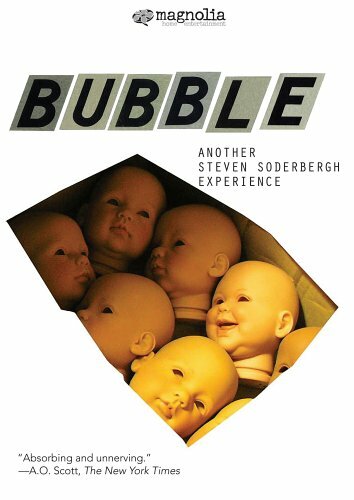 Steven Soderbergh proves he's willing and able to return to his indie roots with Bubble, a 74-minute digital feature starring amateur actors. Paired again with screenwriter Coleman Hough (the dismal Full Frontal), Soderbergh adroitly sidesteps snarkiness in telling his Heartland short story. It's another cautionary tale of the volatility simmering beneath the surface of small-town America, but sincere performances—under the director's sympathetic eye—allow humanity to overshadow the machinery of plot. Set in a depressed Ohio community, Bubble is about the people who do the nation's drudge work. The triumverate of leading characters have much in common: all work double shifts, and all have troublesome personal issues. Young man Kyle (Dustin Ashley) is still living at home with his mother, and his best friend at his doll-factory job is motherly Martha (Debbie Doebereiner, in real life a KFC manager). Martha's protective instincts toward Kyle mingle with sexual jealousy when a young woman named Rose (Misty Dawn Wilkins) takes a job at the factory. Kyle and Rose immediately take a shine to each other, leaving the delicate Martha out in the cold. As the characters' secrets bubble to the surface, the drama turns darker, and darker still. Soderbergh, serving as his own psuedonymoous cinematographer and editor, gets filmic results from HD-CAM. Crosses and angels seem to be in every home and place of business, and Martha's surreal church visits oddly complement the rich vein of imagery Soderbergh taps at the doll factory. Just as they are deadened to the vacant stares of the babies they bring to life and press together, the workers are dull to life and ignorant of each other's feelings. Soderbergh gets especially potent work from Doebereiner, her Martha always just barely hedging her true intent as her feelings roil below the surface. Bubble is a minimalist film, and it briefly turns gawky in scenes involving Rose's ex (unimpressive Kyle Smith). Still, the cumulative effect of Soderbergh's fast-food for thought is properly unsettling. A landmark in film distribution, Bubble debuts in theatres, on television, and on DVD on the same day: Jan. 27, 2006 (Landmark Theatres will sell the DVD at the concession stand; retailers will have it as of Jan. 31). The DVD release comes fully loaded with special features: two feature-length, screen-specific commentaries (one a conversation with Soderbergh and fellow director Mark Romanek, the other with writer Coleman Hough and actors Dustin James Ashley, Debbie Doebereiner, and Misty Dawn Wilkins); a deleted scene with alternate ending (6:03); making-of featurette "Bursting the Bubble" (11:09); highlights of a Soderbergh interview on the HDNet series Higher Definition (9:39); audition interviews (totalling 23:14) with Ashley, Doebereiner, and Wilkins; trailer (1:31); still gallery; and previews for The World's Fastest Indian, One Last Thing, Pulse, and HDNet. The special features are useful for a greater appreciation of the film. The discussion between Romanek and Soderbergh covers the unusual intersection of the performers and the storyline ("I was always willing to bend the movie to fit them," explains Soderbergh). Likewise, the fascinating audition interviews reveal the personal details writer Coleman Hough mined from the actors to enrich the screenplay. On the director's track, Soderbergh name-checks The Honeymoon Killers, asks why actors must be prettier than moviegoers, and the "grass is greener" effect as he shuttles between studio and indie productions. All site content © 2000-2019 Peter Canavese. Page generated at 04/24/2019 07:45:30AM.